February 22, 2016 - Road construction initiated landslides have been a persistent issue on the coast and to a lesser degree within other areas of the province. 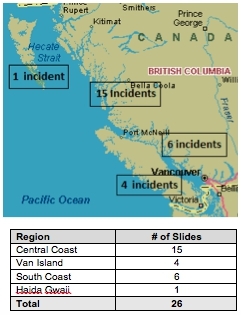 According to recently collected data, there have been 26 such incidents on the coast over the last three years. Nine of these incidents involved excavators sliding down the slope from the road prism during road construction activities. The incidents have been very serious in nature with considerable human, environmental and operational costs. Fortunately we have seen no fatalities to date but both physical injuries and physiological impacts have been common. Some groups have developed partial solutions to the issue but there has not been a united front across the industry to address the problem. On Oct.7, 2014, an informal group of industry, government and consulting practitioners met to explore the issue. The meeting was sponsored by BCTS. One of the actions stemming from the meeting was the formation of a working group that is supported by the Coastal Harvesting Advisory Group (CHAG). A formal proposal based on this action was provided to CHAG and support was confirmed in December 2014. To develop initiatives that support the elimination of slide type incidents during road construction activities on the coast. The working group will focus on coastal road construction but will pass on information to all interested Interior parties. The group has developed a short to medium term strategy to address quick wins that will have an immediate impact, as well as a longer term strategy to sustain improvement and inform other initiatives. •Options for monitoring and enforcement of road construction standards. The outcomes will be shared and used across the industry to create a more uniformed application of improved road construction methods and processes. BC Timber Sales: Mike McCulley, RFT; Western Forest Products: Jack Reynolds, RPF; Interfor: Robert Shelley, RPF; Ministry of Forests, Lands and Natural Resource Operations: Tom Jackson, RFT; and Gino Fournier, RPF, PEng; FPInnovations: Clayton Gillies, RPF, RPBio; BC Forest Safety Council: Dustin Meierhofer, RPF ; Aztec Geoscience: Del Ferguson, PGeo and Ponting Logging: Mark Ponting. Dustin Meierhofer is the director of transportation and northern safety at the BC Forest Safety Council. Early bird deadline for COFI this Friday!